The main male event was an entertaining tournament which has resulted in the emergence of a new name on the trophy. This is because the finalists are Joshua Stacey and Joshua Butler (Pictured), neither of whom have won the event before. There were no early surprises and all 7 seeds expectedly made their way to the Quarter final stage with few problems. The only exception to this rule was Butler, who needed to draw on all of his reserves in turning around a 3-1 deficit to come through against Liam Robilliard in 7 games during their last 16 encounter. Butler then made amends for his defeat to Lawrence Stacey in the Under 21 Open Singles, with a crushing straight game quarter final win. His opponent in the semi final stage was 2nd seed and event favourite Phil Ogier. Ogier had seen off the challenge of 6th seed Paul Hainsworth in the Quarters in 4 tightly contested ends and looked in good form. Butler started the encounter well and with the match poised at 2-2, he dug in and overturned a hefty deficit to pinch the 5th 11-9. Ogier refused to give in and forced the decider, however a run of points from 2-2 and a few slices of luck gave Butler the momentum required to close the match out 11-5 at around 23:30. Stacey was tested in his Quarter final against 8th seed Matt Stubbington, but ultimately came through without too many problems over the course of 5 games. 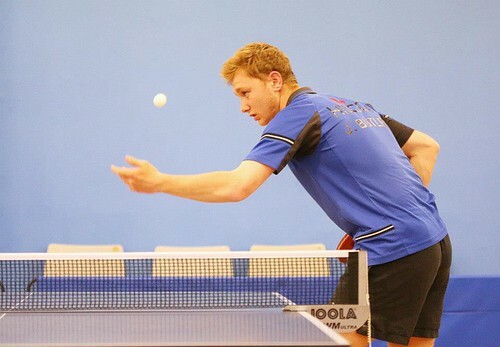 His opponent in the semis was 5th seed Alex Robinson, whom had beaten Stacey 4-2 in the semi finals of the Under 21 Open Singles, just 2 nights reserved. Stacey looked well set to make sharp amends for the earlier defeat whilst leading 3-1, however Robinson comfortably took games 5 and 6 to force yet another decider. The final end was edgy and either player could have taken the win, however it was Stacey to triumph on this occasion during his 2nd match point, a trademark forehand top-spin winner sealing it. In the absence of Alice Loveridge, the top rated duo of Dawn Morgan and Kay Chivers reached the final as expected. The tournament did though almost include the biggest upset of the Championships within this turn of the century. This came during Morgan's encounter against GTTA development officer Becks O'Keefe. O'Keefe competes locally in the 3rd Division and few would have predicted a tight encounter, given Morgan's quality and level of consistency. O'Keefe had done her homework though and was executing her game plan to perfection in opening up a commanding 3-1 advantage, spraying her opponent around the table with controlled shots of both wings. It looked like the top seed was exiting the competition when she was within 2 points of losing the match at 2-2 in the 5th, however she held her nerve impeccably and closed it out 11-9. The 6th and 7th ends were also well contested, however it was the higher rated Morgan who managed to close it out 11-8 in the deciding end.